Journalist, author, magazine editor, museum founder, librarian, photographer, folklorist, ethnographer, avid collector and preservationist, and Indian rights activist. Lummis founded the Southwest Museum of Los Angeles, devoted to the culture of native Americans of the American Southwest. Like Muir, Lummis took a 1,000 mile walk, from Ohio to California, arriving in Los Angeles on February 1, 1885, where he became the first city editor for the Los Angeles Times . He gained a national following with weekly letters about his escapades along the way, later published as a book, A Tramp Across the Continent (1892). Lummis loved, studied, and recorded with wax cylinders the southwest Native American and Spanish California culture. Lummis pursued a lifelong crusade to win basic rights and simple respect for Native Americans. As the editor of Land of Sunshine and Out West he frequently sought after John Muir to contribute articles. As a pioneering photo journalist, he produced a sensitive portrait of John Muir. In the Arroyo Seco portion of Los Angeles, he built a home to last 1,000 years, El Alisal (off-site link - photo gallery by Harold Wood). He built this home with his own hands, over a twelve year period starting in 1898 and ending in 1910. At El Alisal, Lummis entertained many famous visitors, including actors, writers, historians, poets, and artists, including John Muir, who signed his guestbook in 1903. In 1902, Lummis formed an Indian rights group called the "Sequoya League," after the noted early 19th-century Cherokee leader who developed a written alphabet for their language. Its purpose was "the betterment of Indian conditions," and Lummis enlisted many of the leading experts on Indians and the West to join the league's board of directors and advisory board. John Muir himself joined the Sequoya League as a member, sending in donations and dues for both himself and his daughter Helen, saying, "Here is ten dollars for your poor Indians. I feel sure that now something sensible & brotherly will be done for them," and thanking Lummis "for the noble work you are doing for our unfortunate fellow mortals." An early effort of the League led to Lummis finding a home with suitable irrigation for farming for a small group of Indians who had been evicted by a rancher in the Palm Springs, California area. The organization was dedicated to protecting Indian rights, opposing the federal policy that permitted federal Bureau of Indian Affairs officials to remove Indian children from their reservations and send them to far-away boarding schools against the wishes of their parents. These practices cut off hundreds of children from their families, and even prevented from returning home even during summer vacations. Lummis came to regard the U.S. government's Indian education policies as an abomination. The Sequoya League later battled against Indian Agent Charles Burton, accusing him of imposing a "reign of terror" on the Hopi pueblo in Oraibi by forcibly requiring Hopi men to cut their long hair. The League further opposed policies the Office of Indian Affairs attempted to enact prohibiting Native Americans from "wearing Indian costume and blanket" and from engaging in "Indian dances and so-called Indian feasts." Lummis and the Sequoya League argued that preserving "Native American industries" such as the "beautiful, artistic and valuable handiwork they used to do" like basketry, blankets, rugs,silver jewelry, beadwork, and fine pottery (which he said "every educated person recognize as art-work of very high rank") would make the Indians better off than "to make them ashamed of all this, and teach them in its stead to play the mandolin, play football, wash dishes, sew overalls, and the like factory industries of factory minds." For more information, See Biography and Chronology of Charles Fletcher Lummis. For scholarly research, see the Finding Aid to the Charles Fletcher Lummis Papers 1888-1928 from the Autry National Center, Braun Research Library. A special video documentary about Charles Lummis by KCET television will premiere on air and online on May 10, 2016: Charles Lummis: Re-imagining the American West. 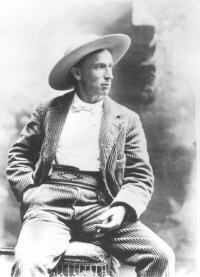 Photo of Charles Lummis courtesy of The Southwest Museum of the American Indian.